The story so far: Yahoo! is in a rut, Microsoft wants to buy it for $44.6 billion, and Google is worried that the Internet’s “openness and innovation” may cease to exist if the two make a deal. Scary times. Update (08/13/09): Yahoo! and Microsoft have agreed to join forces in search. Update (05/04/08): Microsoft gives up on its bid. Here’s a good coverage and a timeline of the whole thing. Update (02/09/08): Yahoo! seems to have rejected Microsoft’s offer. Ars Technica has more for those who aren’t subscribed to the Wall Street Journal. Microsoft: through the PressPass. Tried Googling for Microsoft’s official blog but it’s not in the first page—does it even exist? More importantly, their press release is overflowing with incomprehensible and unnecessary legalese. Come on! Microsoft has very interesting technologies but how do you expect people to cozy up to you or you-plus-Yahoo! with roadblocks like these? Yahoo! : through Yodel Anecdotal. Google may seem to be the most innovative and successful right now, but Yahoo!’s blog, like its other websites, captures the imagination. It’s very cheerfully designed. It shows its products (Flickr, del.icio.us, MyBlogLog) in action. And best of all, everyone can comment! It is that spirit I want to see Yahoo! have more of, even though we’ve seen it from the start (because why name a company “yahoo” otherwise?). It needs to stay alive. 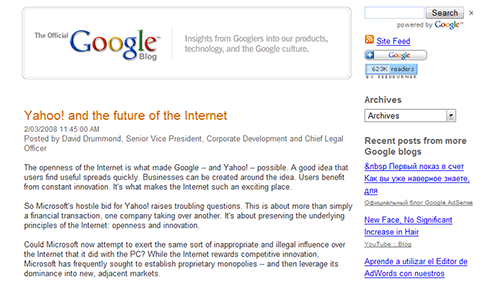 Truth is, I find Google’s blog post and Microsoft’s PR awkward compared to the way Yahoo! handled this one. Maybe I just want to root for the underdog. I’m tired of all the dizzying billion-dollar figures and all the corporate clutter. Yodel Anecdotal is a change of scenery. And yet it’s in dire need of one, too. I think what Yahoo needs is a new visionary who can finally bring Yahoo to profitability.